Aerobika® OPEP can be used in conjunction with any small volume nebulizer with a 22mm adapter and incorporates a high-flow or low-flow range, contains five resistance settings. Flow range is = 10 L/min up to 30 L/min. 5 resistance settings adjust to each patient’s capacity. Lightweight, ergonomic design fits comfortably in the hand. Can be used in any upright position or orientation. 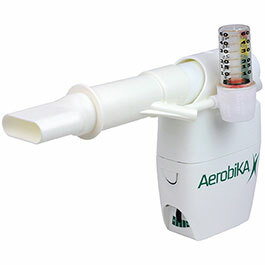 Aerobika® Oscillating Positive Expiratory Pressure Therapy System (OPEP), Case of 10 - MONAGHAN MEDICAL CORP.
Aerobika OPEP can be used in conjunction with any small volume nebulizer with a 22mm adapter and incorporates a high-flow or low-flow range.